Home to the fifth largest number of breweries, microbreweries and brewpubs in the United States—there are over 30 just in Detroit—you won't have far to go to find yourself a tall frosty one in Michigan. While the Great Lake State does encourage responsible consumption of its brewers' arts, there will be no shortage of places to try. Where do you start? 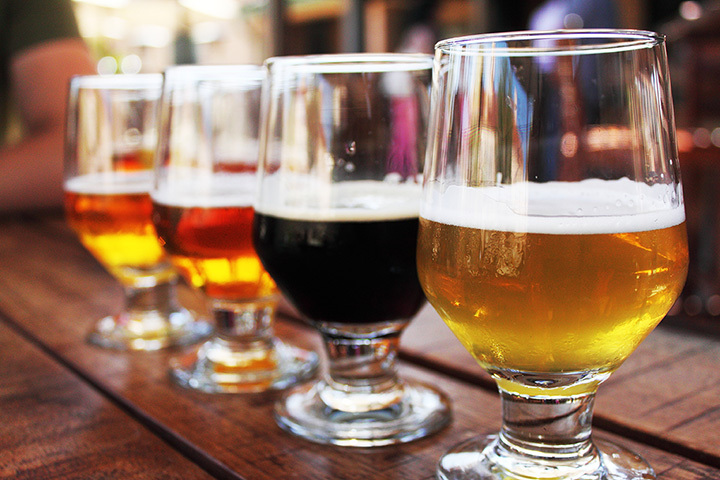 Right here, of course, with this rundown of 10 great Michigan breweries! Kalamazoo is home to Bell's Brewery, a microbrewer known for its iconic brands. For many, it's not quite springtime until it's possible to find Oberon again, and not only does it boast its own brewery, but it also offers a complete pub complex. Featuring a beer garden, brewhouse, music room, and a straight pub all at once, Bell's will offer all the choices of the state's biggest brewery, but with a devotion to quality that can be seen throughout the line. A look at the Beer Advocate top list for Michigan reveals a noteworthy trend: Three of the top five beers on the list are found at the same company: Founders Brewing Company. Grand Rapids—also known as Beer City, USA—is home to this accomplished brewery, whose offerings run the gamut from complete dark beers to a newer breed called Frootwood, a cherry ale—Michigan is known for its cherries—that's kept in oak barrels that held both bourbon and maple syrup. Head out to Ann Arbor to check this little winner out. It's been part of the downtown scene for 18 years, and a look at its methods is proof enough of why. The Brune, one of the best-known entrants in the Ann Arbor craft beer scene, is barrel-aged for three months, then transferred to bottles for another three months before being served. Six months from brew to table, and that's just for starters. A variety of options, including vegetarian, vegan, and even gluten-free are on hand, and the brewery offers a complete page of its menu to allergy-related information. Battle Creek has long been at least an unofficial rival to Kalamazoo, and the Arcadia Brewing Company will give even Bell's a run for its money. Featuring a complete lineup of English-style ales as well as a variety of food options, drinkers will have a range of options from the potent to the smooth and mild. Great for families or for those looking for a fast lunch alongside the die-hard craft beer crowd, Arcadia offers a wide field to choose from and a lot of general appeal. A smiley face with fangs greets those who check out Mason's BAD Brewing Company, and though “bad” is right in the name, you may rest assured it's not indicative of quality, or rather, lack thereof. BAD took home a “One to Watch Award” from MLive in 2013, and since it's still around to this day, it's a safe bet that the watchers were proven rewarded for their vigilance. Check out the live beer menu for what's on cask, nitro, or growler fill, and what's only recently been added. Counted as one of the best newcomer breweries in 2013 by MLive, the Blackrocks Brewery in Marquette boasts what's described as “an ever-changing atmosphere.” With over 14 different beers to their credit ranging from IPAs to limited seasonal releases, there's always reason to come back and check this place out, even when it's a bit out of the way. Grand Haven's Odd Sides Ales represents an oddity in Michigan. Though it's home to many pieces of standard fare, including some reduced-gluten options, it's home some truly unique selections that needs to be tasted to be believed. It's the Hipster BrunchStout, containing three odd flavoring elements: Coffee, maple...and bacon. With 15 taps on hand, even those who aren't looking for a more breakfast beer won't go wanting for choices. Oh, Traverse City, you've done it again. The Right Brain Brewery offers some of the most original beers you'll find anywhere in the state. The Pig Porter is actually one of Google's auto-fill choices for Right Brain Brewery—Pig Porter actually has a 95 percent rating on Ratebeer.com—but drinkers will be able to get in on beer involving lavender tea, vanilla bean, beets, and even a slate of brews inspired by various flavors of pies. Head to Warren to check out a brewery ranked in the top three on a recent Thrillist study conducted wholly on scientific means. Kuhnhenn is not only frequently seen taking home awards from various events, but it's also been recently seen expanding its operations to include a new tasting room along with an outdoor beer garden. This rapid expansion may well continue to bring more stores offering Kuhnhenn as well. With locations in Ann Arbor and Detroit, Jolly Pumpkin has rapidly made a name for itself in the “sour beer” department. With over 5,000 barrels going out annually—and that in 2015, no less—it's known for several different brews including the Bam Biere and the Oro de Calabaza. Some of these are available year-round, and others are on a strictly seasonal basis. View more Michigan Breweries and Brew Pubs.